To understand Ebola prevention, you first need to understand how it spreads. Ebola is a level-4 biohazard virus. It spreads so easily and quickly that even well-trained doctors wearing protecting masks and gloves keep getting infected from nearby patients. An Ebola infection only requires a single viral organism to enter your body, usually through your mouth or eyes. A person who rubs their eyes with their finger can instantly cause an Ebola infection of a single virus was resting on their finger. Ebola can spread through "aerosols," meaning liquid particles suspended in the air. When a person infected with Ebola sneezes, vomits or coughs, they can create Ebola aerosols. "1 - 10 aerosolized organisms are sufficient to cause infection in humans," explains the Public Health Agency of Canada. (2) This is how Ebola becomes "airborne" even when it is not traditionally categorized as an airborne disease. Sanitizing surfaces is a significant part of any defense against Ebola infections. It is well established that Ebola can be killed with sodium hypochlorite, also known as bleach. It's also killed with methyl alcohol, Triton X-100 (a cleaning agent I use in the lab), and UV radiation. This means sunlight kills Ebola, which is probably why you don't find much Ebola in the deserts of the world. The pathogen tends to come out of humid jungle areas that are dark and damp. If it were to invade the USA, it would be far more "successful" in places like Florida and Louisiana where heat and humidity are commonplace. The pathogen has entered into the Blood at this stage, the deepest energetic layer. Because the Heart controls the blood and the Liver stores the blood, both organs are affected. Kidneys are also involved now, probably because of the Heart/Fire and Kidney/Water balance relationship. Blood heat is prominent and bleeding signs are evident as a result throughout the body at the skin and organ levels. The blood is disturbed and exhausted. This is a terminal stage of febrile illness and death is usually quick. Symptoms are of both excess heat and deficient yin (because the heat has burned up the yin resources). * Bleeding under the skin layers showing as maculopapular rashes over the whole body and larger bleed-outs under the skin. This happens in all epithelial tissues both on the surface of the body as well as on the surface of the organs. Other organ bleeding also. - Pulse: thin and fast or choppy. In preparation for a global pandemic, I would also stock up on various herbal formulas based on anti-viral herbs. My current No. 1 recommendation on this is the GAIA Herbs company, whose products have consistently tested clean in our laboratory. GAIA Herbs makes a number of very useful products in this category, including "Respiratory Defense" and "Quick Defense" formulas. Quick Defense is based on andrographis, echinacea, black elderberry and ginger root, each of which exhibits various anti-viral properties. To my knowledge, these have never been deployed against Ebola, so there's no rigorous proof they help with Ebola infections, but the known antiviral properties of these herbs makes them a likely choice, especially when the world of drugs and pharmaceuticals currently has nothing to offer whatsoever. In the past, I've repeatedly recommended stocking up on sanitizing agents as a key preparedness strategy. I think it's also wise to stock up on food grade hydrogen peroxide and povidone iodine as additional sanitizing agents. These two items might not work on Ebola, but they are very valuable as general-purpose sanitizers and emergency first aid supplies. Remember that if you do plan to deploy these sanitizers in your own home in an effort to kill Ebola viruses, you have to become a near-fanatic about scrubbing down surfaces in an almost obsessive manner. Even then, most homes are made with materials that resist cleaning and easily harbor viruses, such as carpets and textured ceilings. There is a reason hospital emergency rooms are made with a lot of stainless steel and flat, smooth surfaces: they're easy to sanitize. The materials used in your home are probably impossible to sanitize chemically, even with bleach. I have seen some people deploy an array of UV light fixtures in their homes, hoping to destroy airborne viruses with UV light. This isn't a bad idea, since UV light weakens or kills most viruses. But the intensity of the UV rays coming from consumer fixtures may or may not be sufficient to achieve the desired effect. UV light fixtures offer nowhere near the intensity of direct sunlight, for example, and too much UV light exposure can actually damage your eyesight. Everybody knows a global pandemic is coming sooner or later. Humanity is practically begging for one with its destruction of the ecosystem, chemical intoxication of the population and reliance on immune-suppressing medications and food additives. The very structure of human society -- with high-density cities and rapid air travel -- creates a "perfect storm" for the spread of infectious disease. Ebola has a fatality rate of 50 - 90 percent, depending on the strain. It causes severe immunosuppression and often leads to death by internal dehydration from the inability of the intestines to absorb water. 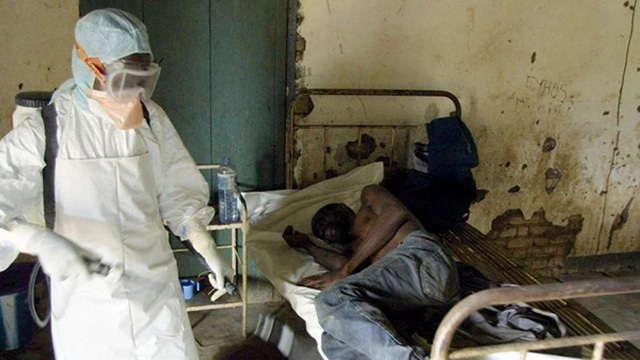 In Chinese Medicine, Ebola is described as a kind of "blood heat" affliction. 1) Lack of sufficient sleep. 2) Consumption of processed junk foods. 5) Sedentary lifestyles (avoidance of exercise). 6) Avoidance of sunlight (not spending enough time in nature). 7) Nutritional deficiencies of important minerals like zinc. 8) Chemotherapy and radiotherapy treatments. 9) Exposure to pesticides, herbicides, glyphosate and other chemicals. This last point is a huge one: eating GMOs suppresses immune systems so much that I believe the most likely people to die in the next pandemic that sweeps through North America are those who eat a lot of GMOs. To avoid this, buy organic. If you get infected, what to do? If you suspect you might be infected, the very first thing to do is isolate yourself from others so that you don't spread the disease. Then call for help. To my knowledge, there are no known natural cures for Ebola, but because it is an immunosuppressive disease, it makes sense to follow many of the same rules you'd follow for other viral infections: stay fully hydrated, boost your vitamin D blood levels, get plenty of rest and don't stress yourself. Anywhere from 10 - 50% of people survive Ebola infections, and it's unknown what these survivors have in common. They might all have higher vitamin D levels or a physiological advantage of some sort that hasn't yet been identified. The conventional medical system might offer you some anti-viral drugs, but their effectiveness is minimal unless deployed very early during the onset of the infection. For the most part, the way western doctors deal with Ebola patients is with a "watch and wait" approach. The patient either conquers the infection on their own and wakes up on the path of recovery, or they never wake up at all. In other words, modern medicine with all its claimed advances still has about the same approach to Ebola as a doctor in the 1800's: hope the patient survives (and try not to infect yourself in the mean time).